If your business uses a number of thermometers, then a reference thermometer is the ideal way of checking them to ensure their on-going accuracy. Reference thermometers are supplied with 5 point UKAS calibration certificates so you are guaranteed that they have checked to the highest standards prior to delivery. Reference thermometers or calibration thermometers are high accuracy thermometers which are ideal for checking the accuracy of temperature testing equipment, such as other thermometers, dataloggers, probes etc. 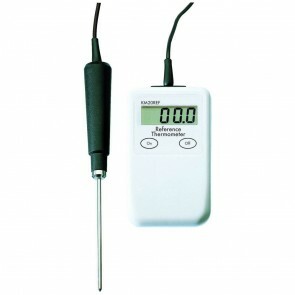 Thermometer calibration can be carried out very simply using a reference thermometer. To check the accuracy of a regular thermometer, both thermometers (the reference thermometer and the thermometer being tested) should be placed into a stable medium, such as water containing melting ice and temperature readings taken from each thermometer. If the thermometer being tested reads the same as the reference thermometer (within acceptable tolerance limits) then the thermometer can be considered accurate. Reference thermometers are supplied with a UKAS Calibration Certificate, which means that it has been tested for accuracy to internationally recognised standards and that its high level of accuracy is assured. It is recommended that the reference thermometer is only used for testing other thermometers, rather than being used on a daily basis for temperature testing. By having the reference thermometer calibrated by a UKAS certified lab once a year it will ensure that the thermometer's readings can always be relied upon. Our reference thermometers are accurate to +/-0.2°C of the reading making them amongst the most accurate instruments on the market. They are supplied with a 5 point UKAS certificate - meaning that the accurate has been tested at 5 different temperature points.